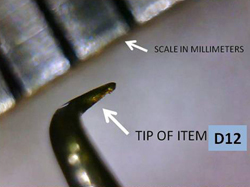 ITEM #D13: TINY RIGHT ANGLE MICRO PROBE. Somewhat heavier duty than the more delicate D12 Nano Probe (listed below). A double sided probe that has a right angle probe on one side and a straight, pointed probe on the other. ITEM #D4: STRAIGHT PICK/PROBE. Our most basic pick or probe. It's a sharp, starting out off the handle at 0.12" and going to a needle point (be carefull - it's sharp!). To buy please email Pentooling. Be sure and provide a shipping address that the US Postal Service will accept. ITEM #D3: CURVED PICK/PROBE. Similar to our D4 straight probe, this is our second most basic probe. It's also very sharp but has a curved tip instead of being straight. Good for poking and probing and also works very well for cleaning or enlarging ink flow channels in feeds. ITEM #D12: A 1mm RIGHT ANGLE NANOPROBE / PICK. Ideal for removing Sheaffer O-rings and cap clip anchors, to name a few applications. The tiny tips of this tool are delicate, so think of it as an instrument, not a crowbar. To buy please email Pentooling. BE SURE TO INCLUDE YOUR SHIPPING ADDRESS SO WE CAN PROVIDE A PRICE WITH SHIPPING COSTS INCLUDED. International customers please provide your street address, city, province/prefecture even if that info is included in your postal code, to avoid problems with the US Post Office website when shipping your order. ITEM #D20: TINY HOOK PROBE / PICK. The hook has a .077" (1.94mm) outer diameter. Great for getting way down in there and pulling small things out. ITEM #D21: 3 DIMENSIONAL TINY HOOKED PROBE / PICK. This hook has a 1/16" (1.58mm) outer diameter, and the hook is in a plane which is at an angle of 90 degrees to the shaft of the probe. Think working sideways way down in there. ITEM #D14: FOUNTAIN PEN SAC RESIDUE REMOVER - DOUBLE SIDED. Ideal for removing the hardened latex sac material that has welded itself to the inside of your pen barrel. Two sides, one measuring .21" (5.25mm) wide and the other measuring .163" (4.15mm) wide. And they are each at different angles to the shaft to provide two different approaches. ITEM #HT-E: LARGE BURNISHER, .27" (7mm) WIDE. Also usable as a large sac scraper (remover) for large pens such as Duofold Seniors. Made from German Stainless steel. To buy please email Pentooling. Be sure and provide a shipping address that the US Postal Service will accept. If you're outside the US,try your address on Google Earth. If they can find it, it is probable that the USPS will accept it. If the shipping address is outside the US, please include a Shipping phone #. ITEM #HT-G, HT-U, HT-UG: FINE GENERAL PURPOSE PICKs THAT ARE VERY SUITED FOR VACUMATIC FILLING UNIT PELLET REMOVAL. (Note: you need to use a bud burr - available/listed below - to put a tiny hole in the old pellet before using these tools). These tools are also ideal for cleaning or enlarging ink channels in feeds. We offer three types of these, one with a round cross section (HT-G), one with a triangular cross section (HT-U), and a new version with each of the above tips on an opposite end of the same handle (HT-UG). If you’re new at Vacumatic filling unit pellet removal, you probably want to use the circular cross section. It’s a little less capable of doing damage than the one with a triangular cross section on the tip. The triangular one is a little more useful, but only in the right hands. If you’re not good with tools or just beginning, use the round cross section pick. The triangular one grips the pellet much better, and the pellet will be more likely to rotate with the pick to ease it out. But the sharp edges of the triangular cross section can do damage to the hard rubber socket if you’re not real careful. Made from German Stainless steel. HT-A = 0.111” - good for aluminum pellet retainers. HT-B = 0.076” – good for aluminum pellet retainers. HT-BC: one side = 0.061” - good for hard rubber pellet retainers & the other side = 0.076” - good for aluminum pellet retainers. Note that we offer (2) sizes of spoons for aluminum pellet retainers, HT-A & HT-B. This tool replaces both HT-B and HT-C. HT-A and HT-B are still available and are listed below. HT-C is no longer available. This tool (HT-BC) has different sized scoops on each end. 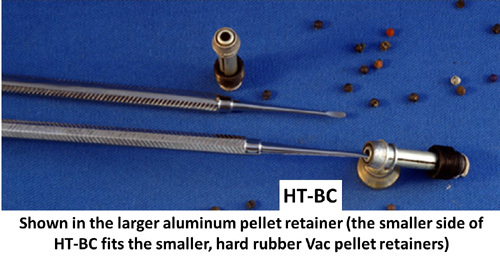 It has the smaller size of the old HT-C scoop for use on hard rubber Vacumatic pellet retainers on one side and on the other side it has the larger scoop the same size as the HT-B for use in removing Vac pellets from the larger aluminum pellet retainers. Both tools have been incorporated into this one tool which replaces them both (HT-B and HT-C). Works great for removing Vac pellets from both types of pellet retainers. This is a double sided tool with different sized ends on each side. Again, don’t get the idea that you’re just going to reach in there and pluck that ball out while it’s cold, dry, and tight. You need to follow the ball removing instructions under “REPAIRING A VACUMATIC FILLING UNIT” in the “Tools for Parker Bodies and Filling Units” menu item on the “TOOLS” page (About the 3rd item down). That should help you ease the pellet out without damage to the pellet retainer. Made from German Stainless steel. ITEM # HT-A: A well defined spoon shape that works great for removing the diaphragm pellets from aluminum Vacumatic filling unit sockets. This size is a little tight inside a hard rubber Vacumatic socket. (See HT-BC for that application). The filling unit pellet fits right into the curvature of the spoon. This is a double sided tool with identical ends on each side. Don’t get the idea that you’re just going to reach in there and pluck that pellet out while it’s cold, dry, and tight. You need to follow the pellet removing instructions under “REPAIRING A VACUMATIC FILLING UNIT” in the “Tools for Parker Bodies and Filling Units” menu item on the “TOOLS” page (About the 3rd item down). That should help you ease the pellet out without damage to the pellet retainer. Made from German Stainless steel. ITEM # HT-B: A tiny curved spatula, slightly smaller in width but much thinner (flatter) than the spoon on HT-A. This is a double sided tool with identical ends on each side. Works great on Aluminum Vacumatic filling unit socket pellet removal, and It’s also useable on Hard rubber sockets, but HT-BC has a similar shape and is better suited for the smaller hard rubber sockets and it's less likely to cause breakage in hard rubber. Again, don’t get the idea that you’re just going to reach in there and pluck that pellet out while it’s cold, dry, and tight. You need to follow the pellet removing instructions under “REPAIRING A VACUMATIC FILLING UNIT” in the “Tools for Parker Bodies and Filling Units” menu item on the “TOOLS” page (About the 7th item down). That should help you ease the pellet out without damage to the pellet retainer. Made from German Stainless steel. BELOW: Front-side, Back-side, and side-view of ends (both ends are same). ITEM #BUD BURR: PARKER VAC PELLET REMOVAL BURR. An ideal tool for putting a pinhole in the pellet left over from a deteriorated diaphragm in a Parker Vacumatic. This will leave a hole the correct size for a pick to follow and complete the ball rremoval job. Small enough to fit through the hole that the filling unit has in it. You may want to add liquid (as a lubricant - diluted detergent solutions work well) followed by a little heat to soften things up and avoid damaging the brittle hard rubber socket that some Vacs use. DON'T USE A HEAT GUN!!! Use this tool in a rotary tool such as a Dremel or flex-shaft grinder in conjunction with a pick. This has a 3/32" shaft. Another helpfull tool for this job is a vacumatic ball drilling shield to protect hard rubber sockets from damage while boring a hole in the ball. ITEM #WHEEL BURR: A PARKER VAC TOOL TO HELP IN THE CLEAN -OUT OF HARDENED RESIDUE REMAINING IN THE DIAPHRAGM SOCKET AFTER THE BALL IS REMOVED. Use this tool in a rotary tool such as a Dremel or flex-shaft grinder in conjunction with a pick. This has a 3/32" shaft.